I've been a member of a magnificent organization for 5 years now, the Society of Childrens Book Writers and Illustrators. SCBWI is a national organization, but the great part is, all the states in the U.S. have different chapters and my chapter, Indiana SCBWI, is very active. Every year we have several conferences and events which bring publishers, writing professionals, and the latest market information to a location close by for a reasonable cost. This Saturday is something new though. IN-SCBWI is hosting a Brunch & Bookfair in Carmel, Indiana to celebrate the recently published books of 15 Indiana authors. At the brunch, Saundra Mitchell is going to speak about online marketing and then the bookfair is held in town at Barnes & Noble. 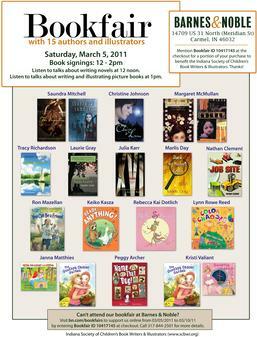 You don't have to register for the bookfair, so if you're in the area, check out the talented Indiana authors and illustrators, get a book signed, and hear the short presentations that are going on from 12:00 - 2:00.